There's something quite zen about this low-budget, late era slasher from many of those responsible for The Evil Dead. Maybe it's the night shoot or the quiet grocery store locale. Whatever it is, even as the killings begin, the proceedings have a pleasant calming effect. It's like hack n' slash yogurt; sweet, to the point, and easily digestible for even the most ardent of non-slasher fans. Longtime Raimi compañero Scott Spiegel apes (or pays tribute?) his friend's directional style with a heavy-hand. The film is brimming with "impossible" shots like the camera in a trash pail, at the bottom of a shopping cart, or resting under the dial of a rotary phone while looking up at the caller. This put me off a bit upon my first viewing, though I assume this got Raimi's blessing and it acts like the slasher he never directed. The cast, including Sam and Ted Raimi, are all great, but the standouts are Elizabeth Cox and Danny Hicks. Cox brings a strong final girl presence and she falls into that odd group of actors that went on to do essentially nothing despite their impressive turns. Hicks is fantastic, nailing the portrayal of a rolled up sleeved, workaday everyman we've all known at one time or another during our working lives. This makes the character's psycho snap come with even more impact. The then newly-formed K.N.B. Effects deliver the gory goods with bloody slashings, meathook hangings, and a bevy of extreme cranial violence. Every effects piece is impressive and gives a grisly look at might be with all those '80s slashers still suffering with cuts. Wizard/Full Moon presents the film in it's full 88 minute uncut version. Paramount's original VHS is heavily cut, sometimes to the point of the feature's editing breaking down into nonsense. Wizard's DVD isn't that great otherwise, but the print quality is 100% consistent, bright, and free of heavy damage. This one certainly deserves to sit next to your multiple copies of Evil Dead and Army of Darkness. And no, Bruce Campbell is barely in this, so it's not worth mentioning. 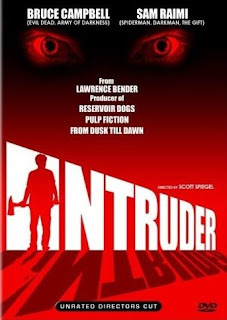 Intruder is one of my favorite slasher flicks. Love all those whacky camera shots! It's definitely worth grabbing Mr. Astro! Big fan of this movie! If you thought Spiegel goes crazy with the Raimi camera in this one, check out From Dusk Till Dawn 2.